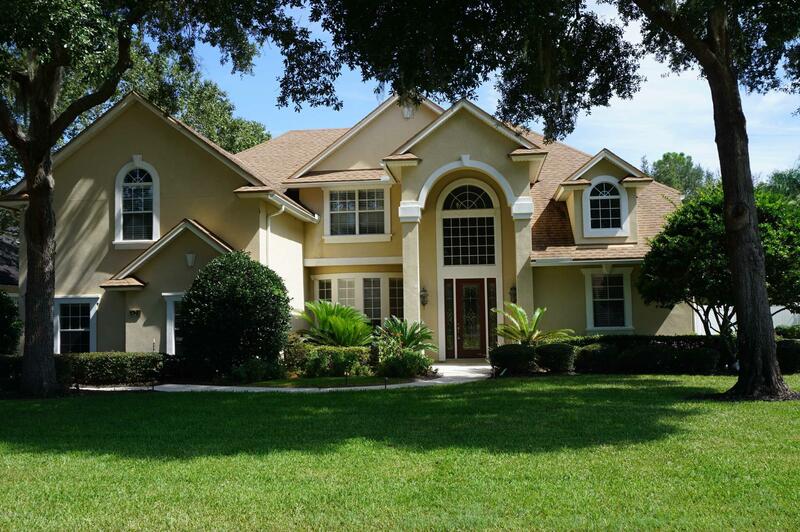 Enjoy Julington Creek amenities and a park like setting with this spacious 5 bedroom, 4 bath home. Entry foyer with separate dining room and living room/office. Large family room with fireplace. Adjacent kitchen has granite countertops, stainless steel appliances, built in ovens, breakfast bar, nook and island. Master suite on main floor with dual walk in closets, garden tub and separate shower. Second bedroom and laundry also on main floor. Upstairs is a bonus room with wet bar and adjacent bedrooms and bath. Many custom features: designer ceiling fans, skylights in many rooms, elegant tile and wood flooring, custom built-ins and wood trim. 3 car garage, separate irrigation meter, water softener. Large fenced back yard with paver patio and hot tub. Lawn & hot tub care included in rent.